Posted by admin in activity reports, Africa, Alaska, Batu Tara, Chaitén, Chile, Dukono, eruptions, Fuego, Guatemala, Hawaii, Indonesia, Japan, Kamchatka, Kilauea, Manda Hararo, Pacaya, Papua New Guinea, Philippines, Russia, Sakura-jima, San Miguel, Sarychev Peak, Shishaldin, Shiveluch, United States, Weekly Volcanic Activity Reports. 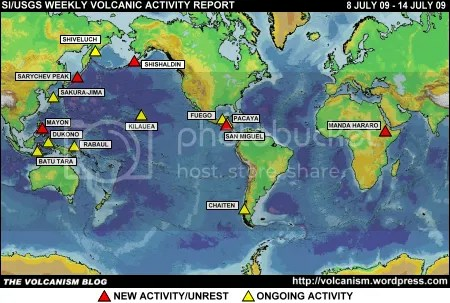 The Smithsonian Institution/United States Geological Survey Weekly Volcanic Activity Report for 8-14 July 2009 is available on the Global Volcanism Program website. The following is a summary and not a substitute for the full report. New activity: Manda Hararo (Ethiopia), Mayon (Philippines), San Miguel (El Salvador), Sarychev Peak (Russia), Shishaldin (Alaska, USA). Ongoing Activity: Batu Tara (Indonesia), Chaitén (Chile), Dukono (Indonesia), Fuego (Guatemala), Kilauea (Hawaii, USA), Pacaya (Guatemala), Rabaul (Papua New Guinea), Sakura-jima (Japan), Shiveluch (Russia). Manda Hararo (Ethiopia). A team of scientists visited the area on 4 July following detection of a sulphur dioxide plume and thermal anomalies over 28-30 June. Steaming was taking place from a 4-5 km long fissure, which was lined with 30-50 m high scoria ramparts, and new predominantly ‘a’a lava flows 2-3 m in thickness were observed. No active lava effusion was occurring. Mayon (Philippines). Phivolcs undertook an overflight on 8 July and observed a ‘cone-shaped pile of hot, steaming old rocks’ that may be the source of the summit incandescence observed recently. The 1 cm of uplift measured during 15-22 June was shown to have been sustained by a survey on 9 July, summit incandescence intensified and steam emissions were observed. The alert level for Mayon was raised from 1 to 2 (moderate unrest) on 10 July. San Miguel (El Salvador). The amplitude of seismicity decreased during 9-13 July but remained above background. Sarychev Peak (Russia). Diffuse gas-and-steam plumes were observed on satellite imagery 8-10 and 12 July. Plumes drifted 15 km E on 9 July, 40 km E on 13 July and 25 km N and NW on 14 July. Shishaldin (Alaska, USA). A thermal anomaly at the summit crater which has been observed intermittently since January 2009 became more intense over the month before 10 July, and there were some reports of steaming from the summit crater. AVO raised the Aviation Colour Code to Yellow and the Volcano Alert Level to advisory. Batu Tara (Indonesia). On 8 July ash plumes rose to 2.4 km and drifted 55 km W and NW, and during 12-14 July ash plumes rose to 1.5 km a.s.l. and drifted 25-55 km W, NW and N.
Chaitén (Chile). During 3-8 July gas-and-ash plumes rose 1.5 km above the growing lava dome complex and collapses caused by unstable slopes generated block-and-ash flows particularly in the western area of the complex. On 10 July ash plumes rose to 1.8-2.4 km a.s.l. and drifted NE. Dukono (Indonesia). On 8 July ash plumes rose to 2.4 km a.s.l. and drifted 85 km NE. Fuego (Guatemala). Explosions, some accompanied by rumbling noises and shock waves, on 10 and 14 July produced ash plumes to 4.1-4.6 km a.s.l. and drifted 10-15 km W and SW. Incandescent material was ejected to heights of 75 km and incandescent avalanches descended ravines. Fumarolic plumes rose 100 m and drifted S and SW.
Kilauea (Hawaii, USA). Lava flowed SE through the lava tube system to Waikupanaha and Kupapa’u ocean entries and active surface flows were revealed by thermal anomalies and visual observations. Both ocean entries produced explosions on 8 July, with explosions at the Waikupanaha entry ejecting incandescent tephra up to 20 m high. The Halema’uma’u crater vent continued to produce a mainly white plume drifting SW. Since a ‘deflation-inflation’ event on 4 July no lava or incandescence has been seen from the crater. Pacaya (Guatemala). Fumarolic plumes from MacKenney cone drifted S and gas plumes rose 300 m on 10 and 14 July. Multiple lava flows 150-600 m in length travelled SW.
Rabaul (Papua New Guinea). Night-time incandescence was visible from Tavurvur cone during 3-9 July. Steam plumes rose 1.5 km above the crater. During 9-10 July ash plumes rose to 2.4 km a.s.l. and drifted 20-40 km NW, N and NE. Sakura-jima (Japan). During 8 and 10-15 July explosions sometimes produced plumes to 1.8-3.4 km a.s.l. which drifted NE and E.
Shiveluch (Russia). During 3-10 July seismic activity was above background, on 2 and 4 July ash plumes possibly rose to 5.3 km a.s.l., and steam-and-gas plumes with some ash content were emitted during the reporting period. A gas-and-ash plume observed on 3 July rose to 3.3 km a.s.l. A daily thermal anomaly was observed over the lava dome. The foregoing is a summary of the Smithsonian Institution/United States Geological Survey Weekly Volcanic Activity Report covering 8-14 July 2009. It is provided for information only, and is based on but not a substitute for the full report, which comes with its own criteria and disclaimers. The map base is derived from the Smithsonian Institution/USGS/US Naval Research Laboratory This Dynamic Planet website.